Wow what a crazy week! Between studying for my Fitness Theory exam and this social life I somehow picked up along the way I’ve had minimal time for blog writing, but don’t you worry, I’ve got lots of exciting things in store for you lovely readers! I realize that if I want people to actually read this thing I’ll have to be a little more consistent with my writing, so I promise to work on that. This week the man of the house went back to Ontario to visit his family and friends so it’s just been myself, the cat and the rat since Monday. Grocery shopping usually occurs sometime between Saturday and Monday, and since it was just going to be myself consuming all the food this week I figured I would wait until I was on my own. I’d only buy what I need and it would be much less expensive than shopping for two, right? Apparently not. I somehow managed to spend just as much, if not a little bit more, than we would spend for the two of us. In my defense we were running pretty low on some of our kitchen staples, so I did have to do a bit of a restock. Which brings us to today’s topic! What do you need in your kitchen to set you up for healthy and happy (and frugal) success? Most of these items I can’t bear to go without, so the order in which I discuss them has no effect on their importance. Rolled oats are a great thing to have on hand because who doesn’t love oatmeal? (Unfortunately I know that number is actually quite large, but try oatmeal the way I make it and I’m sure you’ll become a fan!) When I say oatmeal I don’t mean that processed Quaker garbage-crap. I mean a real bowl of hot, satiating oatmeal. Instant and quick-cooking oats have much of their nutritional value stripped away because they’re processed to cook faster, so try to stick to rolled oats or even better, steel cut oats! I like to jazz up my oats in a number of ways: apples & cinnamon, raisins and a bit of maple syrup, and my all time favourite, banana and almond butter. I also like to make my own granola with my oats, add them to smoothies for extra fiber, and use them as a topping for healthy individual apple crumbles (I’ll share that recipe another day 😉 ) Sure, you can buy a box of 10 packs of instant oatmeal for around $3.50, and yeah they only take 90 seconds in the microwave. You even get the lovely addition of guar gum, “caramel colour”, and refined sugar among other things. I bought a 1kg bag of plain rolled oats, which works out to about 25 servings, for $2.99. No guar gum though, so maybe I got ripped off. I like to keep a variety of grains on hand: brown rice (NOT the instant kind), quinoa, and pasta noodles are the most common, however I also like to mix things up once in awhile. I just bought some wheat berries and they are awesome little things! So far I’ve added them to salad and oatmeal and they worked well in both situations. While I do believe that modern day society is heavily grain-dependent (our ancestors didn’t have heavy agricultural techniques and they survived just fine! ), I’m also realistic and understand that the time-saving and nutritional value of grains is something to enjoy when you’re busy but trying to maintain a happy, healthy, and stress-free life. Another kitchen essential (which I know is frowned upon by some) is canned goods. “BUT THE SODIUM!” I know, I know. So I buy no-salt added when I can and rinse the contents when I can’t. Having a variety of canned beans and tomatoes on hand makes it easier to prepare quick and healthy meals at home, so you’re likely going to consume less sodium than you would had you gone out and picked something up for dinner. I’d like to point out that you can also buy dried beans in bulk, soak them, and then cook them in large batches to portion out for later use. This is something I would really like to do, I just…haven’t. Now that I’ve admitted this to you I’m probably going to go out and buy a few bags of dried beans. Another fantastic find from the bulk section is raw nuts, seeds and dried fruit! Forget buying expensive pre-made trail mix that’s loaded with unnecessary oil and sugar; you can easily make your own portion-controlled bags of energy! I like to measure out 1/4 cup portions of my favourite fruit & nut mixtures, usually consisting of dried cranberries, almonds, cashews, sunflower seeds, dried apricots, hazelnuts, brazil nuts….I could go on and on. The combinations are endless! If I’m feeling really crazy I’ll maybe throw some carob chips in there as well. Nuts and seeds are chock full of those healthy fats I discussed in my last post and are great additions to salads, soups, and yogurt mixtures. Which brings me to…..Greek yogurt! Ahh, lovely, rich, creamy Greek yogurt. This protein-packed version (18 grams per serving!) is amazing mixed with some fruit and a bit of the granola you made with your rolled oats, but its duties do not end there! I also like to use it in place of sour cream on top of potatoes, mixed into tuna salad instead of mayonnaise, and even blended with some herbs to make a creamy veggie dip. It serves so many purposes I feel lost when my yogurt supply runs dry. Casein, one of the proteins found in yogurt and many other dairy products, is a slow-releasing protein which makes Greek yogurt a perfect bedtime snack that will feed your muscles all night long! Speaking of muscles, my next favourite kitchen essential is protein powder! This is what I like to call my Meat Head cupboard. My 5lb tub of vanilla whey is too large to stand up, and I also have a large tub of Vega One Natural vegan protein blend. Vanilla whey (or any flavour for that matter) is a really versatile ingredient. Post-workout I’ll shake a scoop with some almond milk, but sometimes I like to blend it into smoothies, mix it into oatmeal, and even make pancakes with it! Yes! Protein pancakes! AH-mazing. 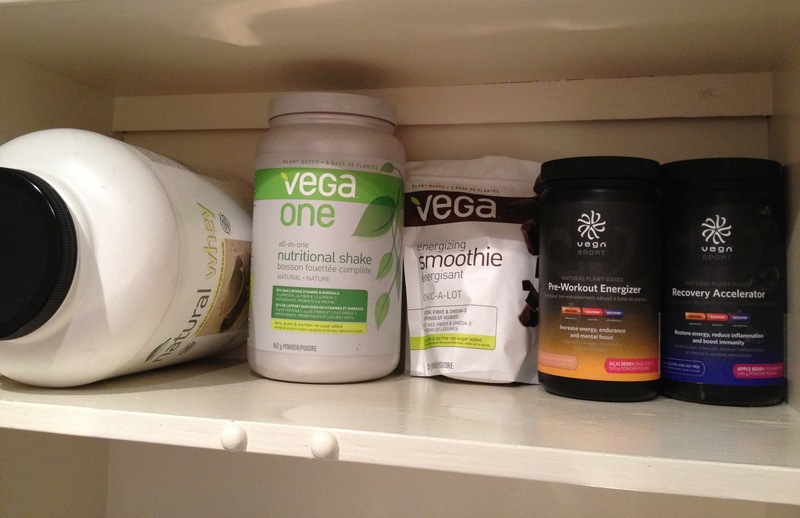 The Vega One Natural has a very distinct earthy taste, but it’s barely noticeable blended into green smoothies. It even contributes to the green colour! Vega has a variety of other products which I plan to write about in a future post, so stay tuned. And of course, PLANTS! ie. fruits & veggies! The great thing about this category is that you can really tailor it to meet your own preferences, and there are so many options you’ll never get bored! Some of my favourites to have on hand are apples, bananas, spinach, kale, yams, bell peppers, cucumber, and onions. I find that when I have these, along with the other aforementioned items, I am able to throw together a a quick breakfast, lunch, or dinner when I’m in a hurry. I also like to mix it up each week and incorporate whatever’s fresh and in season at the moment. Head to your local vegetable market and stock up your fridge. I dare you to try something new! Go out on a limb and incorporate vegetables into your breakfast! My idea of gettin’ crazy is seeing how many servings of vegetables I can eat in a day. Fo’ real. Variety of dried herbs, spices, and seasonings – salt is overrated! Yes our body does need salt, but not in the quantities that the average person consumes. Try some salt-free seasoning like Mrs. Dash, or spruce up your soups and stews with things like cayenne pepper or paprika. The water-retaining parts of your bodies will thank you. So there you have it! If you stock your fridge and pantry with these items I promise you will be able to whip up something to eat in no time! Sure, these may not make the most glamorous meals, but when you’re in a pinch they’ll do the trick. 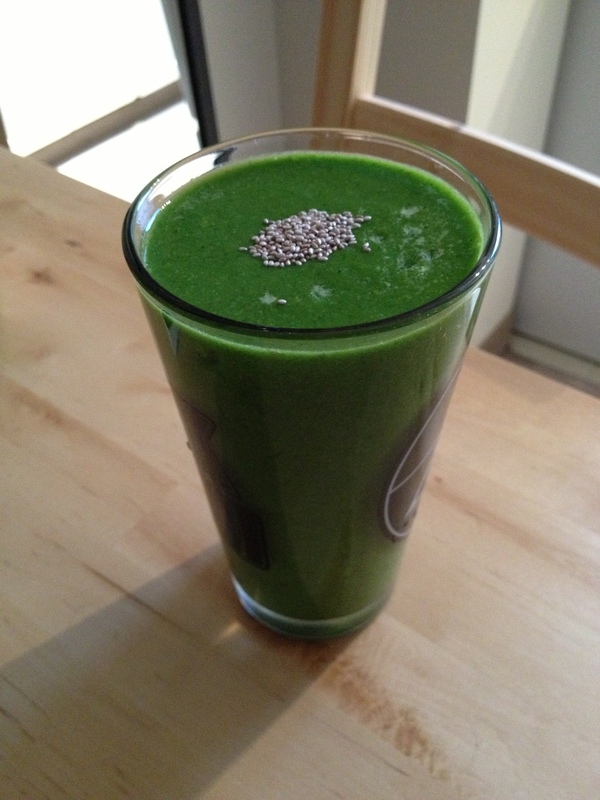 Spinach is a great leafy green to start adding to your smoothies. It has such a mild taste that disappears as soon as you add something sweet. As you get more adventurous start trying other leafy greens like kale or swiss chard. 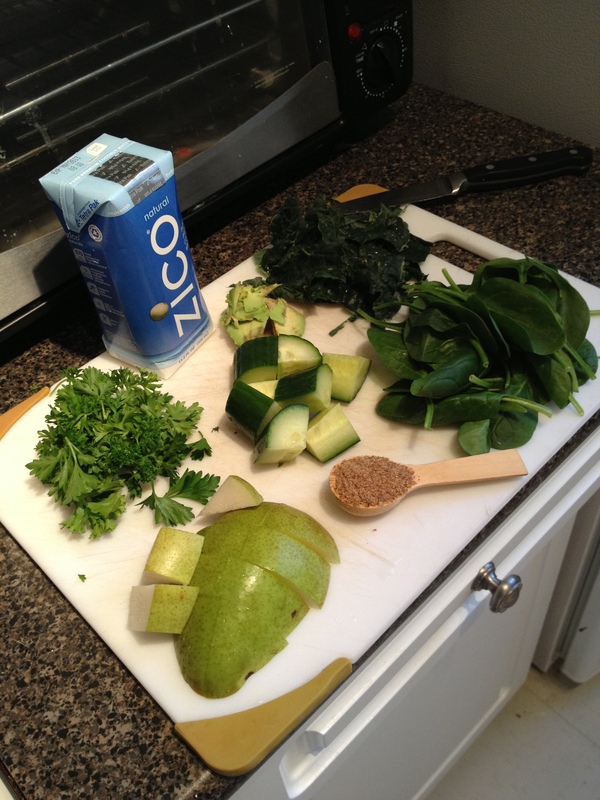 Now this is the best part: blend your greens with your liquid FIRST, before adding any other ingredient. This will pulverise them first so there will be minimal bits to get stuck in your teeth. As a liquid I often just use cold water, but milk and its non-dairy varieties, coconut water, and 100% juice work great as well. Now you can add some other veggies! Celery will give it a surprisingly peppery taste, while cucumber will add freshness. I sometimes like to grate some beet into as well for an extra antioxidant boost. Experiment with other vegetables like carrots, broccoli, or even peppers! Adding fruit will give your smoothie some sweetness. Bananas are always a great choice, as are berries, apples, and pears. 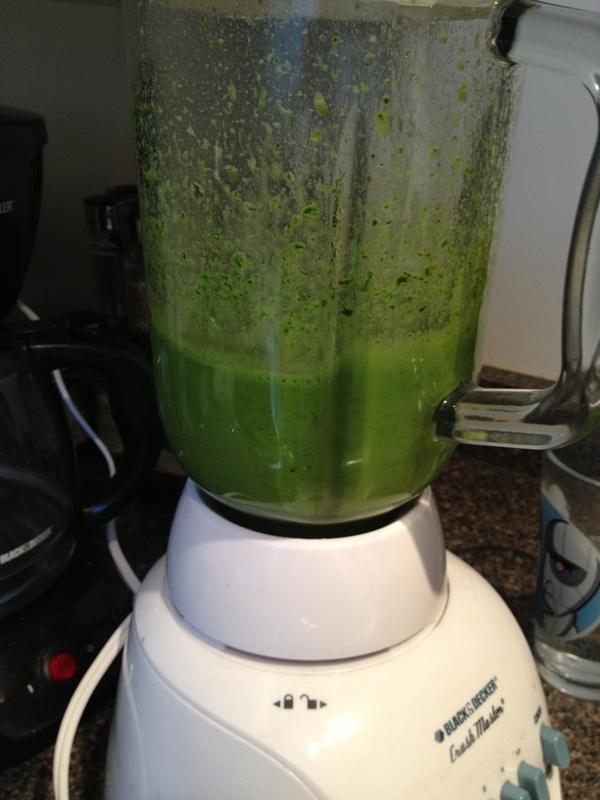 A pear, banana, spinach, and cucumber smoothie has made a few appearances these past couple of weeks. Frozen fruit works really well here; you can either freeze your own or buy bags of pre-frozen fruits. I always hear of people hatin’ on frozen fruits & veggies, but they’re frozen while they’re still fresh so they contain much of their original nutrients. Eat ’em up! Now you have a delicious base to add some fun mix-ins to. I like ground flax seeds (our bodies can’t digest whole flax seeds well enough to reap their nutritional benefts! ), chia seeds, hemp hearts, coconut oil, cinnamon, and parsley to name a few. I recently learned that parsley isn’t just a garnish or breath freshener! It also aids the digestive process, helps detoxify the liver, and can even improve your estrogen balance (this one will be put to the test shortly). You could also add rolled oats, softened soaked nuts like almonds or walnuts, and avocado for creamy, dreamy goodness. If I’m in need of something less than a meal but more than a snack I’ll add my Vega One in here. Add some ice, blend until smooth, and you’ve got yourself a nutritional powerhouse in a glass (or whatever vessel you choose to put your green smoothie in). I should note here that the fruits, vegetables, and mix-ins you add may take the “green” out of the green smoothie, however it will still be just as nutritious. Starting clockwise from the top left, here I have parsley, coconut water (I don’t normally buy the stuff, but I got a free sample from Whole Foods), avocado, kale, spinach, ground flax, 1/2 a pear, and a cucumber in the middle. The pear was sweet enough to balance the bitter flavour of the kale, and I have a feeling the parsley helped to neutralize it as well. The avocado made it so creamy. 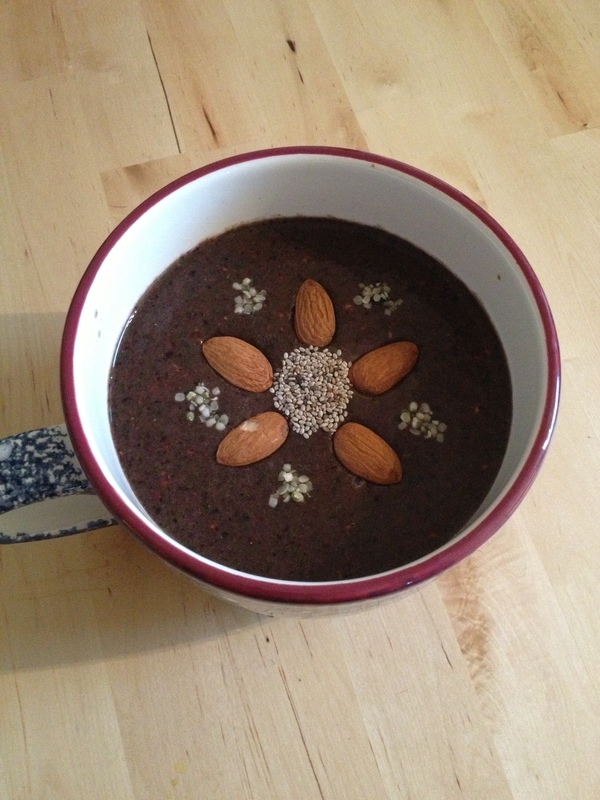 Here’s the finished product, topped with chia seeds! Smoothies are so amazingly versatile, there’s something for everyone. They can become dessert-like with the addition of cacao powder, flavoured whey protein, or Greek yogurt. You can even let out your inner artist and make some of those creative smoothie bowls that have been popping up on Instagram lately. Alright I’m done with the pictures. I knew eventually my love for taking pictures of my food would pay off. That’s all I’ve got for this week! What are some things you can’t live without in your kitchen? Any smoothie recipes you love? I’d love to hear them! This is a really great help! I’ve only just started having to “brown bag” it, so this will give me some ideas for a healthier shop this weekend. So far, I’ve been portioning things like quinoa and spaghetti squash in the freezer so I can just grab a bag or two of something from the freezer for my lunch. This works well for me – I can mix things up and adding quinoa to stuff, like a little bit of chili, is really filling. I’d like to try one of those smoothies – do you think an immersion blender would do the same thing? I don’t have a blender. Can’t wait to try the pear smoothie! I just attempted to make an apple, cucumber, carrot & beet smoothie with my immersion blender and it didn’t work 😦 I cut everything into smaller pieces than I do when using my blender but no dice. Sorry! Hey! Wow I’m sorry for the delayed response!